Nowhere else can you feel the heartbeat of the KALDEWEI brand more powerfully than at the KALDEWEI ICONIC WORLD. 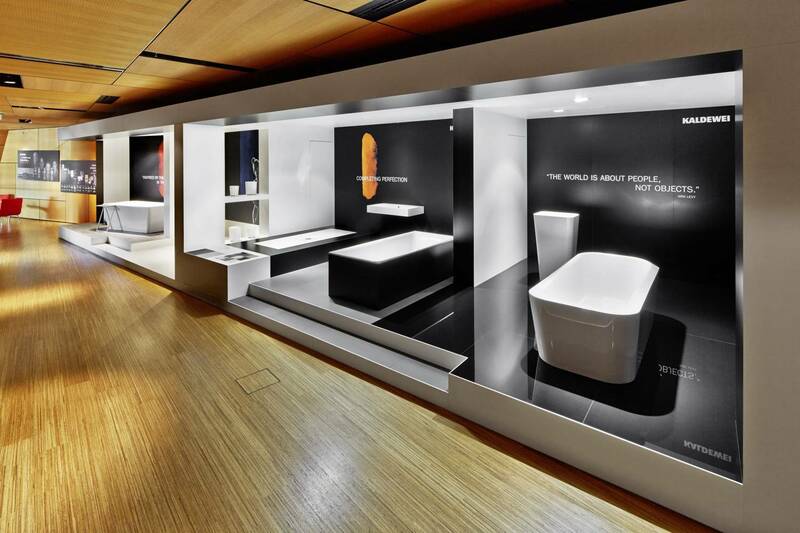 Visitors are immersed in the fascinating KALDEWEI brand world, which is presented over four floors. Devised as a training and exhibition centre, the KALDEWEI ICONIC WORLD is now an international meeting point for our market partners from all over the world. Whether for architects, planners, wholesalers, skilled tradespeople, residential developers, hoteliers or our own employees – our central motivation is to awaken enthusiasm for pioneering spirit, stylish products and sustainable, intelligent solutions. With the opening of its new Iconic World, KALDEWEI has created an extraordinary brand experience. The newly designed exhibition allows insights into the premium manufacturer’s understanding of design and gives visitors the opportunity to see the quality and durability of KALDEWEI steel enamel for themselves. One of the key sections of the new Iconic World is the Material Excellence area. Here it quickly becomes apparent why KALDEWEI steel enamel became the company’s brand core. Visitors discover the material’s distinctive qualities by means of impressive experiments. These include dropping a 7-kg weight onto an enamelled shower surface or heating a steel enamel plate to a temperature of over 1000 °C with a Bunsen burner flame. Further KALDEWEI-references are available on our website. The KALDEWEI ICONIC WORLD is also a vibrant brand forum thanks to design exhibitions, seminars, workshops, lectures and events. While our exclusive models are stylishly presented at temporary themed exhibitions on the first floor, another exhibition on the second floor provides a generous overview of the great diversity of the KALDEWEI range. 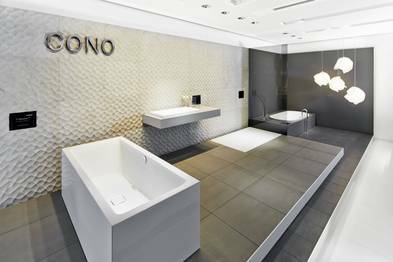 After all, KALDEWEI now has a portfolio of over 500 enamelled shower surfaces, bathtubs and washbasins. The didactic concept of the KALDEWEI ICONIC WORLD is complemented by a tour of the factory during which visitors get a close-up look at the production process. The architectural highlight is the integration of the enamel furnace into the KALDEWEI ICONIC WORLD: observing from a panorama platform above the smelting furnace, visitors can watch enamel being manufactured at first hand, and feel the high temperatures of the rotary furnaces and the humidity when the red-hot enamel mess is quenched. Would you, as a professional client, like to visit us, find out more or take part in our seminars and thus experience the KALDEWEI brand for yourself? Please contact us to make an appointment. We look forward to your visit.